Growing up in the suburban hell of Misery Saga (a.k.a. Mississauga), Lizzie has never liked the way she looks—even though her best friend Mel says she’s the pretty one. She starts dating guys online, but she’s afraid to send pictures, even when her skinny friend China does her makeup: she knows no one would want her if they could really see her. So she starts to lose. With punishing drive, she counts almonds consumed, miles logged, pounds dropped. She fights her way into coveted dresses. She grows up and gets thin, navigating double-edged validation from her mother, her friends, her husband, her reflection in the mirror. But no matter how much she loses, will she ever see herself as anything other than a fat girl? In her brilliant, hilarious, and at times shocking debut, Mona Awad simultaneously skewers the body image-obsessed culture that tells women they have no value outside their physical appearance, and delivers a tender and moving depiction of a lovably difficult young woman whose life is hijacked by her struggle to conform. 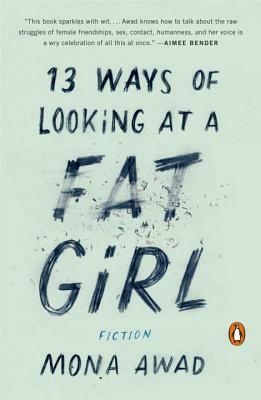 As caustically funny as it is heartbreaking, 13 Ways of Looking at a Fat Girl introduces a vital new voice in fiction. Mona Awad received her MFA in fiction from Brown University. Her work has appeared in McSweeney’s, The Walrus, Joyland, Post Road, St. Petersburg Review, and many other journals. She is currently pursuing a PhD in creative writing and English literature at the University of Denver. "Awad tells Lizzie’s story from a variety of different perspectives and in different scenes, some deeply funny, some dreamlike, many tragic. Throughout, her prose is lively, while her insight into the often-baffling complexities of being a woman is touching and sharp." —The Atlantic, "The Best Books We Missed This Year"
"Awad is a fine writer with a keen sense of black humor, which makes this often sad story more entertaining than you might expect." —Lynn Neary, NPR's "Guide To 2016’s Great Reads"
"A ferocious look at body image and how it permeates every aspect of our lives. At times funny, at others heart-breaking, this is an important one to read this year." —BookRiot, "The Best Books of 2016, So Far"
"Dark and caustically funny...[This] book somehow manages to strike a balance between depressing and hilarious. —Time Out New York, "The 15 Best Books of 2016"
“Mona Awad writes exactly what you’re thinking, and that’s one of the many reasons you’re going to love her debut. . . . [13 Ways] announces her as a writer with real insight not only to the mind, but also to the heart.” —Bustle, "17 Of 2016’s Most Anticipated Books"